This topic provides descriptions of the rock types appearing on the British Geological Survey 1:625 000 scale map of the UK North and gives a brief explanation of their origins. The whole of the United Kingdom can be shown on two large map sheets at a scale of 1:625000. Traditionally the British Geological Survey has used this scale—approximately ten miles to one inch or 50km to 8cm—to publish a summary of the UK geology. The northern sheet covers Scotland, Northern Ireland, the Isle of Man and part of northern England and the southern sheet covers Wales and most of England. One pair of maps illustrates the bedrock geology and a second pair illustrates the Quaternary geology. The first ‘ten-mile map’ edition was produced in 1948, compiled laboriously by the reduction of the maps from the 1:63 360 scale (one inch to one mile) series. 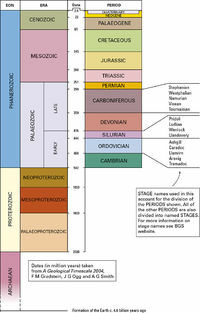 The key of coloured tablets arranged in a column showed the rock units in a time-related or chronostratigraphical order ranging from Precambrian to Tertiary†. Each tablet carried a letter that defined the geological time period (Figure P785796). The second edition (published in 1957) of the southern sheet was almost identical to the first, but the youngest strata shown on the northern sheet were Pliocene (late Neogene) whilst on the southern sheet some Quaternary strata were shown as Pleistocene. In 1977 a separate Quaternary edition was published for the first time. For the third edition of both bedrock geology sheets (1979), a uniform key of numbered units was adopted: 1 to 59 for metamorphic and igneous rocks and 60 to 115 for chronostratigraphical sedimentary units ranging from Precambrian (oldest) to Pleistocene (youngest). Most of Northern Ireland was included for the first time as part of the northern sheet. For the fourth edition (2001) the geological lines used in the third edition were digitised and then plotted, with minimal change, onto a modern topographical base. This new edition (fifth) has been produced on an entirely different basis, having been compiled directly from the BGS database of 1:50 000 digital geological map data. The source dataset is one of a series produced by the BGS DiGMapGB project (Digital Geological Map of Great Britain) which is responsible for creating nationwide digital geological map data at a range of scales from 1:10 000 to 1:625 000. This book and its companion volume for the North Sheet describe briefly the map-making process and some of the different rock units that lie beneath the surface. Most of northern England including the Lake District appears on both sheets but is described in more detail in the UK North book. The use of technical terms and unfamiliar rock names has been kept to a minimum but some readers may find useful a glossary of geology such as The Oxford Dictionary of Earth Sciences (2003). The map shows the distribution of the different rock units that lie at or near the surface but it must be stressed at the outset that not all of the rocks can be seen at the surface. Most are covered by superficial deposits, the unconsolidated sediment that has accumulated in relatively recent geological time, within about the last two million years, as a result of glaciation, river action or any other processes involving erosion and deposition. The superficial deposits are shown on a separate map. The bedrock map is compiled from information collected at surface outcrop and from excavations or boreholes that penetrate through the superficial layers. Where information is sparse the geologist will extrapolate the known boundaries utilising aerial photographs and remote sensing methods such as satellite imagery or geophysical measurements. Thus the geological map is based on some direct observation and much interpretation. The geologist must also use interpretative skills at another level. In many places the contact between the different rock types is abrupt and can be represented accurately by a line on a map but commonly one rock type passes gradually into another. The end members may be distinct but the boundary between the two types may be a matter of judgement. Geologists record their initial observations on large-scale maps, and in Britain these are usually at the 1:10 000 scale. Great detail can be recorded but, with reduction in scale, information is merged and generalisations are made until a satisfactory distillation of the regional geology is achieved†. This is then related to a sequence of named intervals for which a time-scale in years has been established (Figure P785796). Conventionally, distinctive rock sequences are named after geographical areas in which they are particularly well displayed. Thus, the British rock succession carries a series of local names, but these are just places where there are typical examples — the rocks concerned commonly have a much wider distribution. Most named assemblages of distinctive strata are described as formations, but significant local variations in lithology may allow the formations to be divided into members. Related formations are commonly associated together as groups and it is these levels of the hierarchy that are mostly represented on the ‘ten-mile maps’; more rarely, several groups may be combined into a supergroup. How do we know the age of the rocks? How to determine the age of rocks. P785797. Some originated as layers of sediment on the sea bed or lake floors (so they are called sedimentary rocks) and may contain the fossilised remains of animals or plants. These fossils can give a relative indication of age, with different fossil assemblages appearing in vertical succession (oldest at the bottom, youngest at the top) and each one having a lateral correlation with the same assemblage in other areas. 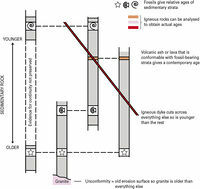 Absolute, or numerical, age determinations are obtained by careful measurement of the proportions of minor radioactive components in igneous rocks (that were once molten), or metamorphic rocks (those much changed by great heat and high pressure). These proportions are ‘frozen-in’ when the molten or reheated rock cools and solidifies, and thereafter the radioactive elements decay steadily at a known rate. By integrating both kinds of evidence (Figure P785797) we can build up an accurate timetable of when things happened. Rocks provide the evidence for the passage of time, but whereas time is continuous the record preserved in the rocks is not. However, the gaps may themselves be informative, indicating periods of uplift and erosion. Such major changes are driven by one fundamental phenomenon — the crust of the Earth is not static. It is made up of huge plates, around six kilometres thick beneath the ocean and 30 to 40 kilometres thick beneath the continents. These move slowly across the face of the Earth, floating on the dense, semi-molten rock beneath and driven by the convective heat flow therein. The crustal plates variously collide, move apart or slide past each other, producing irresistible tectonic forces that stretch some parts of the Earth’s crust whilst squeezing other parts. Stretching causes thinning of the crust, subsidence and the formation of basins that fill with sediment; compression causes thickening of the crust as the rock layers fold and buckle to produce mountain belts. A stretched plate will eventually break, allowing new volcanic material to erupt and a new ocean to form between the fragments of the old continent. Where two plates collide, one may plunge under the other to be recycled in the Earth’s interior; this process is known as subduction. Sometimes, a slice of the condemned plate escapes and rides up onto the margin of its oppressor; this process is known as obduction (Figure P785798). 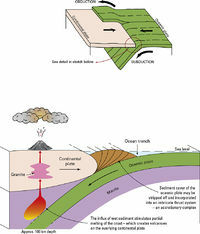 Obduction and subduction, schematic model. P785798. 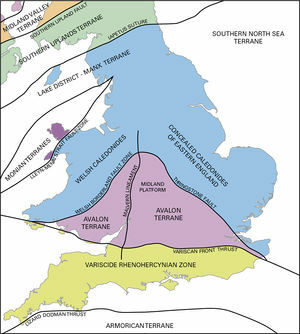 Terrane boundaries in the UK originating from the Caledonian and Variscan cycles. P785833. The geological history of Britain shows an intermittent drift from high southern latitudes to our present northern location, punctuated along the way by several episodes of continental collision and break-up. The nature of the rock record gives some indication of continental positions — evidence for desert sandstones or equatorial forests perhaps, or the type of animals preserved as fossils—but an important modern technique allows us to locate the original position of rocks by their palaeomagnetism. Just as the isotopic character of a once-molten rock can be used to calculate its age, so the palaeomagnetic fabric of a rock helps to determine the place on the Earth where it was created. This is possible because the ambient magnetic field at the time of its formation can be locked into a rock and retained as a geographical record over a geological time span. As we go back in time, interpretation of the data becomes more difficult, and the conclusions drawn become less confident. Nevertheless it is pretty clear that by around 600 million years ago, all of the Earth’s land areas were combined into one massive ‘supercontinent’ known as Rodinia, though not all of the future parts of Britain were adjacent to each other (Figure P785799a). By about 500 million years ago Rodinia had fragmented and a huge ocean (Figure P785799b)—the Iapetus Ocean separated England, Wales and southern Ireland (then part of the Avalonia–Gondwana continent) from Scotland and the northern part of Ireland (then part of the Laurentia continent). The Iapetus Ocean progressively closed over the next 100 million years (Figure P785799c) and by 400 million years ago the different parts of northern Britain had been juxtaposed (Figure P785799d) though the extreme south and much of Europe did not catch up for another 50 million years. By about 250 million years ago, the Earth’s land areas had recombined to form the ‘supercontinent’ known as Pangaea (Figure P785800e) but, in its turn, Pangaea began to break up about 200 million years ago (Figure P785800f) and, by 50 million years ago, development of the Atlantic Ocean was well under way (Figure P785800g). This remarkable, if convoluted, geological history has produced the sequence and distribution of rocks seen in Britain and Ireland. The succession of collision and accretion events also means that they can be viewed as a series of geological terranes, each one characterised by a unique rock assemblage and tectonic history, but separated from its neighbours by major fault zones (Figure P785833). All of this helps to explain some seemingly paradoxical relationships that were inexplicable when the first editions of the 1:625 000 scale maps were produced in 1948, well before the development of plate tectonic interpretations from about 1960 onwards. For example, much of Scottish geology can be compared more closely with that of Newfoundland rather than England and Wales, while the older rocks of England and Wales have more in common with those of Nova Scotia than with those of Scotland, immediately to the north. Moving continents: reconstructions of the position of the main landmasses and their continental shelves form Neoproterozoic to Cenozoic times. Modern coastlines are included for reference. P785800. These pages aims to assist the interpretation of the accompanying 1:625000 scale map by providing descriptions of the rock types, and by giving a brief explanation of their origins. A convention in geological descriptions is to always start at the bottom, with the oldest rocks, and work upwards towards the youngest rocks. This way we start closest to the beginning of everything. In British terms, the beginning — the oldest rock — is marked by the three-billion-year-old gneisses in the Lewisian Complex of north-west Scotland (Hebridean terrane). But to keep things in perspective, remember that the Earth itself (and the rest of the Solar System) formed about 4.6 billion years ago — and even that was quite recent in comparison with the initiation of the Universe between 13 and 14 billion years ago. This page was last modified on 28 July 2015, at 16:59.